I had never had a Maker's Mark private selection prior to going to Louisville this past Summer. While there, we went to (read: "stumbled to") the Haymarket. It happened to be the last bar we went to on our last night in town. Of course, we were a number of drinks in at this point, but, nonetheless, having finally made it to one of the bars we had targeted from day one, we weren't going to let that stop us from trying out something new. I took a look at the bar, and without hesitation I ordered a Rock Hill Farms (which I honestly couldn't tell you much about that pour other than I liked it, but, then again, I might have enjoyed some ashtray water at that point). My friend, however, ordered a Maker's Mark Haymarket Private Selection. Despite the state that we both were in, the one thing that we did notice and did not forget was that this Maker's Mark tasted unlike any other Maker's Mark I've had before. About a week later I was at Untitled in Chicago for a quick happy hour drink, and I made it a point to try their Maker's Mark Private Selection. Again, it was unlike any other Maker's Mark I've had before. It was rich, chocolatey and spicey, and I left wanting more. Luckily, it was not long after that I found one of these private selection at one of my local Binny's. Despite the price, I jumped at it without hesitation. I even texted my friend to let him know they were there, and he grabbed his own bottle. Each barrel is finished with ten charred staves inserted into the barrel. 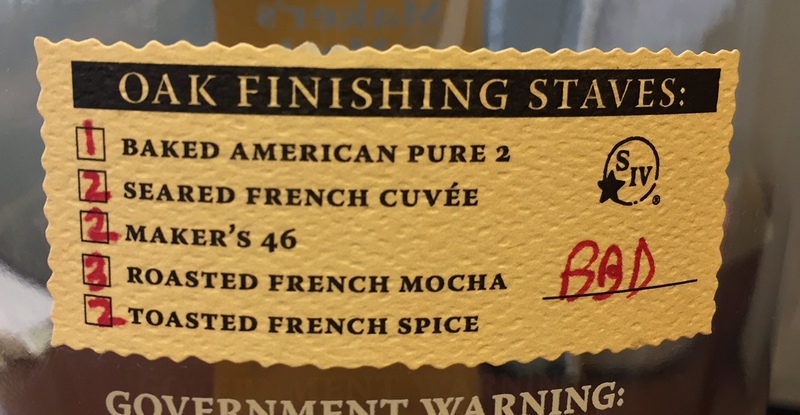 With the private barrel selection program, you can actually select the type of staves used, which can produce different flavors than the standard Maker's Mark or Maker's 46. 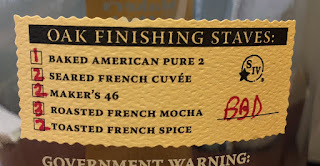 In this case, I must say I was really drawn in by the fact that half of the staves were made up of either the French Mocha or the French Spice. As soon as I broke the seal and popped the cork, the first thing I noticed was the nose. Even from a few feet away, as I was grabbing my glass from the cupboard, I could smell the toffee notes emanating from the bottle. The sweetness of this bourbon was strong from the start. On the first sip I was struck immediately by a blend of chocolate and red wine flavor. It was very rich, matching in many respects the dark color of the bourbon. The chocolate notes were dominant, but the pinot noir red wine flavor seemed to not only keep the bourbon from seeming too sweet but to also offer flavors of dark fruit that complemented the chocolate notes. The toffee flavors that I found on the nose were also present, but not to the extent that the nose had me expecting. Rather, the toffee was there just as an additional little perk, like finding a five dollar bill in your jacket pocket. It won't buy much, but it nonetheless brings momentary pleasure. This bottle certainly brings the heat, but the soft wine and chocolate flavors seemed to help that heat settle pretty quickly, keeping this from being a real burner, as well as keeping it from being too sweet. As the bottle was open for a while, that burn dissipated, and really, the only flaw I found in this product seemed to go away as I got to the final few pours. This was an excellent bottle, and while each selection is going to be influenced by the different staves added to the barrel, I won't hesitate to grab any future private selections I may come across, whether at a bar, a liquor store, or otherwise.